Lord Sensing Stellar Technology Rod End load cells available here at Rhopoint Components are highly accurate, shock and vibration resistant devices, suitable for use within industries such as oil & gas, subsea, test & measurement, defence, medical and many others. These load cells are available at a range of standard load ranges, but the design can be customised to any value achievable and many selectable features and options are available to meet the most demanding requirements - Contact us to discuss. The RDE900 shackle ready, rod end load cell series from Stellar Technology, offers maximum load range from 5k lbs to 100k lbs with an accuracy of ±0.2% FSO BFSL. The RDE900 from Stellar Technology is designed for in-line tension force applications, constructed with all welded stainless steel with bonded foil strain gauged force sensors which provide reliable performance. Hysteresis of 0.15% FSO and an operating temperature range of −65°F (-53.89°C) to +250°F (+121.11°C). The RDE905 general purpose rod end compression and tension load cell series from Stellar Technology, offers maximum load range from 2.5k lbs to 50k lbs with an accuracy of ±0.25% FSO. These load cells are designed for both in-line tension and compression force applications with extreme side, bending and torque loads. The RDE905 from Stellar Technology are constructed with all welded stainless steel with bonded foil strain gauged force sensors, are compact in size and provide reliable performance. Hysteresis of 0.15% FSO and an operating temperature range of −65°F (-53.89°C) to +250°F (+121.11°C). The RDE915 compact, high capacity rod end load cell series from Stellar Technology, offers maximum load range from 2.5k lbs to 25k lbs with an accuracy of ±0.25% FSO. 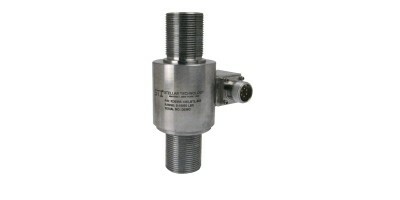 These load cells are designed for both in-line tension and compression force applications. The RDE915 from Stellar Technology are constructed from high strength tool steel with bonded foil strain gauged force sensors being environmentally sealed, are compact in size and provide reliable performance. Hysteresis of 0.15% FSO and an operating temperature range of −65°F (-53.89°C) to +250°F (+121.11°C).